Congratulations to John Link and Peter Blomquist, singles finalists. It was a battle of the fittest after playing their way through a knock out and also a group round robin doubles before the singles final was played just before 6pm. John narrowly beat Peter, 3 all when the final siren went, so in extra time he secured the win 4/3. Thanks to the rest of the players that also played and for your participation in both the singles and doubles. It was great to be able to include Jo Bartholomew, touring member of Prested Hall Club. James Guest and Peter Blomquist won the group being the only pair with 4 wins. Congratulations to Rob Fahey, Steve Virgona and Claire and Sarah Vigrass on their wins at the Australian Open. For full coverage of the event please visit www.hobarttennis.com.au . Well done also to the RMTC professionals Frank Filippelli, Jonathan Howell, Nick Howell and Kate Leeming who made the trip. Frank made the semi-finals of the singles before falling to Rob Fahey and Kate also made the singles semi-finals as well as the doubles final with Amy Hayball. Well done also to RMTC club champion Kieran Booth for taking a set off World No. 2 Steve Virgona and reaching the singles semi-final as well as the doubles final with his brother Hilton and to junior squad member Michael Williams for taking a set of Kieran Booth in the first round. It was also good to see former RMTC professionals Andrew Fowler and Chris Chapman playing in the event. And finally, well done to the HRTC and in particular Barry Toates and Graeme Bradfield for putting on what everyone has said was a well run event. Welcome RMTC to 2012. We have just witnessed an enthralling and thoroughly enjoyable ROO TROPHY in which 60 players took part including friends from interstate and overseas. The singles event continued the use of the repechage system whereby all the 1st and 2nd round losers from the main draw went straight into the repechage (the final of the ROO singles is played between the winner’s of the main draw and the repechage). Played off handicap, we saw many matches going to the wire. In the main draw Nick Manby-Brown (yes, he is known these days as Namby-Pamby) did well, as did John Link and Fiona Hewson all reaching the semi-finals. In the repechage New South Wales current number one, Sav Cremona, as well as Peter Stanley and Richard Pagone all made the semi-finals but it was one of our newest members Jeremy Smart who defeated Sav in the repechage final 8 games to 4. Jeremy’s reward was to play Julian Snow in the 2012 ROO TROPHY singles final receiving the maximum handicap of owe 40 rec 30 banned most things and chases 2 and 3 or better. Despite the seemingly daunting handicap Julian won the final 8 games to 3 playing his usual brand of ruthless tennis. Never-the-less, Jeremy showed that he is a player to watch and as Julian said in his victory speech, “Jeremy will never play off a handicap of 58 again”. In the ROO TROPHY doubles five pools of five teams each played round-robin to determine the best eight pairs to proceed to the knockout phase of the tournament. Those that made it through included Graeme Holloway and John Faull who were no doubt trying to peak in time for this weeks World Masters events, Sav Cremona and Ed. Kemp, Wendy Whitehead and Richard Pagone (otherwise known as the Blonde and the boy), Rob Falconer and Rob Whitehead, Mike MacAleavey and Charles Wright and Peter Estcourt and James Gould. An eclectic group of players if ever there was one, however, the final was played by four of our older members none of which have typically found themselves playing at the meaty end of RMTC tournaments. The final pitted John Link and Mark Miller against the crafty couple of Bob Malseed and Michael Rodd. If smiling won you tournaments the final would have been a high scoring draw. As John Link employed his now infamous lob attack and Mark Miller showed himself to be an early contender for Richmond’s steadiest player status the signs were good, but Bob Malseed had his eye on a trophy and Michael Rodd, playing in only his second tournament despite over ten years of membership, were not going to let the opportunity slip. Malseed and Rodd won 8 games to 5 but all four players had equal airtime during the evening speeches. Bob opened his tour de force by telling everyone he’d never won a tournament but then he remembered he had had a victory with Euahna Varigos. Not being sure of what he meant Michael Rodd interjected swiftly by asking if he meant on or off the court! The tournament finished with everyone gathered for dinner in the marquee. If you are a new member of the RMTC I cannot recommend this tournament more highly as it offers both handicap singles and doubles as well as an opportunity to meet local and far away players alike. Well done to Frank and the team for operating the show and thank you to Annie Holden for her enormous generosity in providing lunch for the players each day and to Lizzie Brown, alongside Frank, Merrin MacKay and Annie, for the impromptu Pizza Night during the tournament. Well done Julian Snow, well done Bob Malseed and Michael Rodd, the 2012 ROO TROPHY singles and doubles winners. On the weekend of the President’s Cup (golf), for those who were not predisposed by golf, the annual Joan M Hayne Doubles was played on Sunday 20th November. Everyone took to their round robin matches with a sense of good fun and with a hint of competitiveness. Injuries and hangovers notwithstanding, the pairs battled it out and thanks to the handicapping most matches were close. The energetic tennis made Lizzie Brown and Sophie Johnson’s magnificent lunch even more rewarding. Following lunch it was finals time. In one semi-final Anabelle Guest and Sophie Johnson were sadly defeated by the ever reliable Kim Dudson and Judith Sear 6-3. Lizzie Brown and Fiona Hewson defeated the strong and energetic Wendy Whitehead and Lisa Galbraith in the other semi-final. Fiona played good tactical tennis and Lizzie hit the ball like she was on fire, with wild hair to boot! Kim and Judith then took on Lizzie and Fiona in the final leaving no prisoners and defeated them 6-0 (Ed. – I think a certain party the night before might have caught up with the veterans Brown and Hewson). Thank you to Kate and CJ for keeping the day flowing as all our gossiping and chit chat threatened to, on occasion, slow proceedings! For those who don’t know, the Joan Hayne Doubles Tournament is a ladies doubles handicap event named after David Hayne’s mother. A staple of the RMTC’s tennis calendar, it was very nice to see some of our newer members having a go such as Ingrid Sykes, Marissa Barter-Waters and Merrin MacKay. For new lady members this tournament is an excellent way to mingle socially and enhance your tennis. [slideshow]The weekend just gone saw the Victorian Open played at the RMTC which proved to be a magnificent spectacle for all who came and watched with both the singles and doubles finals going the full three sets. One highlight was seeing, for the first time, the Men’s and Lady’s World Champions playing doubles together. The Victorian and Tasmanian Opens are the only worldwide events that will allow this to happen. We have had many tight and entertaining matches played over the past few years at the RMTC, some expected and some not so; the Woolner Stone singles final played between World Champion Rob Fahey and Club Champion Kieran Booth proved to be an unexpected gem. Kieran, who has been pitting himself against the game’s best at the various national Opens was eager to test himself against Rob and did so with aplomb. It is one thing to catch the world champion a little off his game but quite another thing to be able to make him pay! For the first half of the match, with Rob giving Kieran just a little too much latitude on his return of serve, Kieran belted the daylights out of the ball hitting numerous main wall and direct hits into the dedans. In fact his hitting was so powerful and accurate that Rob was heard to say during the third set when Kieran finally smashed one high “about time he hit one up there”. However, not for the first time, Rob tightened his game and in doing so reversed the tide of the match (at one point Kieran led the match 6/4 3/1). The final score was 4/6 6/3 6/3 to Rob. 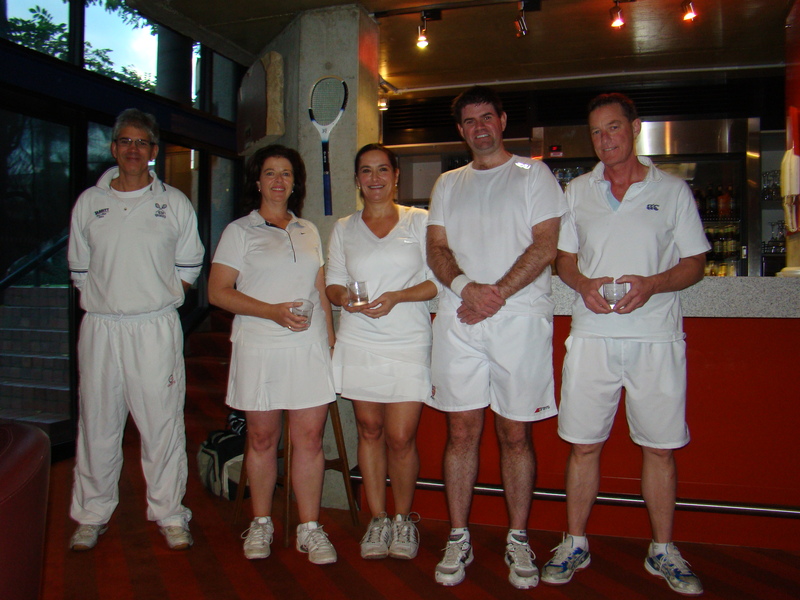 The George Limb Victorian Open doubles final was, like the singles final, played in great spirit. Rob Fahey playing alongside the Ladies World Champion Claire Vigrass (having beaten Julian Snow and Chris Sievers in the semi-final) was pitted once again against Kieran Booth who was playing with our Head Pro Frank Filippelli (and a 7 time winner of this event – they beat Mike Happell and Brett Richardson in the semi-final). Played on the Monday night, the crowd was treated to a high octane match with all four players clearly enjoying themselves. Claire provided the perfect foil to Rob as she volleyed everything that came onto her radar and Rob swept, smashed and ultimately proved too good for the pair at the other end. And the pair at the other end was playing well too. Frank was clearly up for the contest and was able to execute many volleys and deft backhands that would have been beyond most. He also showed that he has a few sneaky serves in his bag of tricks. Kieran, like all of the players was smiling throughout as he continued to play well. Once again the crowd was treated as the match went the distance 4/6 6/3 6/2 in Rob and Claire’s favour. Thank you to Fiona Hewson for arranging the food on Monday night and to the players, markers and spectators for making it an event to remember. The Richmond Hill Silver Racket Handicap Singles, open to the top 16 entrants, was held over the period of 12 – 14 August and we fielded the strongest player group in many years. No less than two World Champions took part (Rob Fahey and Claire Vigrass), more than half the field had a handicap of under 20 and the tournament’s backmarker Andrew Gould was handicapped at 28. Given the format of best of 3 set matches the winner was always likely to be someone with young legs – the winner was required to win 4 such matches without much time for recovery. In the top half the draw Andrew Gould led a charge as he accounted for Nick Shelton in straight sets, World Champion Rob Fahey in 3 sets (5/6 6/5 6/5) which included the saving of 2 match points before he fell to Paul Rosedale in another 3 set marathon. Rosedalehad made it through by beating baby G 6/5 5/6 6/5 followed by Alistair Hill in straight sets. In the lower half Owen Guest survived until the semi-final stage by accounting for Peter Estcourt and Hamish Welsh in straight sets before succumbing to our young professional CJ White. CJ so far had had a relatively blessed run with straight set victories over Ed Welsh and Wally Cockram. The final between CJ andRosedale(the 2009 winner of this event) was close. Both players were playing near their best and neither was expected to favour subtlety over brawn during the match. Early in the matchRosedalehad the ascendancy as his crisp forehands and Railroad sorted CJ out to the tune of 6/3 in the first set. However, from then on, andRosedale’s legs told his brain how tired they were, CJ took control. CJ played the ball from side to side grindingRosedaledown to win the match 3/6 6/3 6/1. CJ’s win playing off 18.8 (Rosedale16.7) was we trust another step in the right direction in his journey to becoming a club/tournament professional. Last night the final of the Alan Hamer Club Doubles Championship was played by reigning title holders Mike Happell and Bret Richardson and the challengers Julian Snow and Chris Sievers. The first set was a tussle with the 6th game taking more than 10 minutes. Happell and Richardson started strongly going to a 4-1 lead with Happell returning well and playing the forehand corner at the service end with guile allowing the ever ominous Bret Richardson to dominate the net – and true to type, Bret could be found anywhere at the net from the Door Gallery to the main wall. Julian was as ever always competitive; in particular, his backhand proved to be a significant weapon as the match progressed. However, despite Snow and Sievers being able to win the long game and take the score to 4-2 Happell and Richardson’s superior team play allowed them to close out the set 6/3. The second set progressed in similar vein to the first and ended in the same score line, 6/3 to Happell and Richardson. In both sets Sievers began serving to Happell which left Snow to serve to Richardson. Needless to say, all four players had many moments in which they showcased their superior abilities, all four have won club doubles titles and in Julian Snow’s case a World Doubles Championship, but if one player stood out on the night as having made the difference it was Bret Richardson. His aggressive returning of serve, railroads and volleying often brought a swift end to a point. Still, at two sets to love down Snow and Sievers made it clear that they were in for the long haul if given the opportunity. And sure enough, as the players tightened just a little, the third set proved to be the closest of the lot. Snow seemed to find a little bit extra as he took every ball at the receivers end that was not destined to find its way into the Grille – unlike most poachers he made every shot count for the betterment of his team. For a while it seemed as though every reste went backwards and forwards from Snow’s backhand to Happell’s forehand with the end result being a Snow bound Dedan either direct or via the main wall. In taking the set 6/4 the match now threatened to keep those watching up later than expected, ah well, it was better than watching Wimbledon anyway. Despite Snow’s backhand prowess and Richardson’s menace, and Siever’s excellent bobble serving and protection of the Grille, shot of the night as acknowledged by Snow after the match had to go to Happell. From deep in the backhand corner at the service end Happell, despite heavy cut from a Snow forehand, managed to lob a ball into the Grille notwithstanding Sievers appearing to be almost sitting inside the Grille in his attempt to stop the errant grenade. The fourth and what proved to be the final set was still tight but all the big points were being won by Happell and Richardson. Happell and Snow were both showing a few signs of fatigue and under these circumstances the team work of Happell and Richardson proved the better fit than the Snow driven combination. Final set score 6/1. When the cat’s away the mice will play and with the Kool Kats all away doing their serious stuff in Van Diemen’s Land there was much uninhibited and relaxed fun at a very nice party Her Majesty gave for her birthday on Monday 13th. In the end a couple of young bandits (possibly glad to be called young but there was a septuagenarian in the comp to give perspective) succumbed to the total lack of scruple of young women playing shots that no professional taught them. Diane Rennard and Brigitte Claney were the victors against Mike Carroll and Paul Scally after coming back from a first round beating (3/6) to win 6/2 in the final. From the dedans it looked as though some manual adjustments were in order before any of us have to play any of them again off handicap. None of the dignified ladies and gentlemen on the Limb Court for preliminary rounds ended up with a prize but a decisive early blow was struck against an ancient but canny pair that looked as though they might have gone the whole way. In his first tournament back after many years not playing our 1988-1990 President Richard Hall was giving a very good account of himself, especially with an accurately pitched sidewall serve which hugged the back wall, when a sudden movement returning serve did in a monkey muscle. And that was despite all the good advice available as usual at the RMTC about warming up, stretching, yoga, pilates, deep breathing, heavy breathing…… A cold pack and Euahna’s laser acupuncture gave hope by the end of a day spectating that Richard will be back soon as a highly desirable partner before his handicap again reaches realistic levels. In case there should be any fears of discontinuity it should be reported that Henry Turnbull and Andrew Gould got as far as a semi-final. It will probably be Henry who occupies the sad vacancy created by John Hewson as a presumptive finalist in doubles handicap tournaments. His volleying is at least as pugnacious, not to say reckless. Jonathan Howell and Kate Leeming helped make the day and enjoyable success, and Jonathan, standing in for Richard Hall so his partner James Guest could keep on playing, didn’t find it necessary with that partner to do too many “professional” shots to avoid embarrassing victories. Despite talent such as Simon Carr’s heading fast towards where his father Nick used to be it cannot be said that the tribute the RMTC paid to Royalty was rewarded with auguries of a World Champion to be. But it was fun. Overshadowing the other major Melbourne event on Sunday 27th March was the Old Scholars Handicap Doubles, as eight teams all representing fine institutions of learning from the past (some finer than others), gathered at the RMTC to do battle and determine the Old Scholar’s winner for 2011. Divided into two groups and tasked with playing three 8-game sets, highlights included the re-emergence of long-time members Ian Lindsay and David Worth, who played well in their first tournament in quite some time, as well the evergreen James Guest dispatching a Virgona-style cut volley into the tambour from second gallery. The pool winners both emerged from 7-7 advantage all scenarios, with the Scotch College pair of James and Andrew Gould facing Russ Middleton and Greg Reid of Melbourne High in the final after clearly tight matches in their respective pools. The final was close despite the score line, as all four 40-40 games went the Goulds way resulting in a 8/2 final win for Scotch. Overall the Old Scholar’s was played in a very good spirit as always, and a fantastic roast lunch capped off what was an enjoyable day for all.